Growing from a hero on the Chicago streets to a hip-hop household name, Lil Durk commands a loyal legion of fans with his melodic and poignant songwriting. Culminating a meteoric rise that transcends regions and trends, Durk shares Signed to the Streets 3, his first studio album since 2016’s Lil Durk 2X. 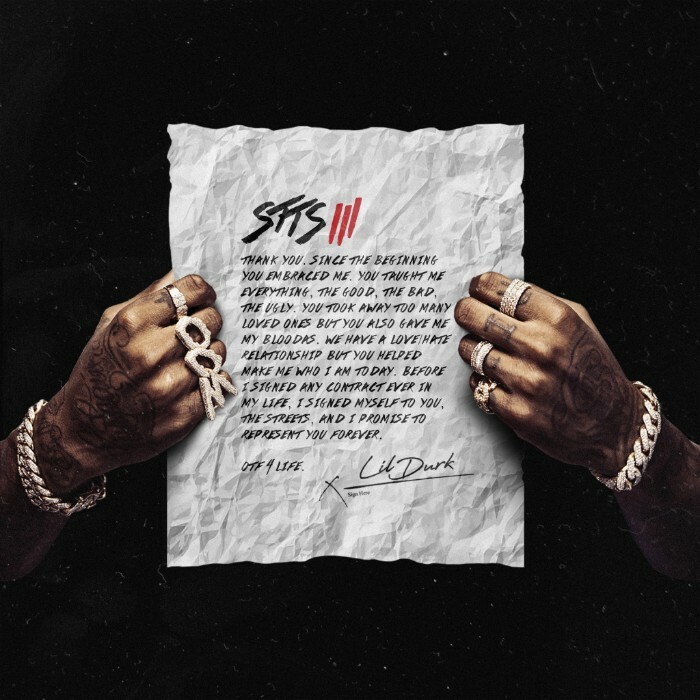 A continuation of a series that began with Durk’s 2013 breakout mixtape Signed to the Streets, released when he was 21-years-old, Signed To The Streets 3 is a coronation for Lil Durk, affirming his position as a major rap star and confirming his influence on a new generation of melodic street rappers. Drawing guests from across hip-hop’s generational and geographical spectrum, Durk welcomes them all into his world in STTS 3, providing stark perspectives of street life with a strong emotional center, enhanced by Durk’s superlative sense of melody. Featuring additional guest spots from Kevin Gates, Ty Dolla $ign, Kodak Black, and A Boogie Wit Da Hoodie, Signed to the Streets 3 releases via Alamo/Interscope, and already finds itself at #6 in Apple Music’s all-genre album charts within the first 12 hours of release. The new album gives a home to popular previously-released singles like the Future-featuring “Spin The Block,” which has over 15.5 million views on YouTube, “Downfall,” with guest spots from Young Dolph and Lil Baby, the slow-burning hit “Home Body,” featuring Gunna and TK Kravitz, which has over 6.4 million plays on Spotify and is currently burning up rap radio, “Rockstar,” the album’s closing track which features an appearance from Lil Skies, and the recently released Neighborhood Hero,” which will soundtrack a series of videos in which Durk and other artists, including Meek Mill, Trae Tha Truth, and Nipsey Hussle, highlight their efforts towards improving their communities. Catch “Neighborhood Hero” on Spotify’s Off The Strength playlist, featuring Lil Durk on the playlist’s cover. Yesterday, Lil Durk offered fans a final sneak peek at the album when he shared “Play With Us” via SoundCloud. Premiered by Complex, “Play With Us” finds Durk and guest star Kevin Gates emphatically asserting their supremacy, threatening haters, listing their accomplishments, and painting gorgeous melodies over piano-laden production.